This manuscript contains of a variety of devotional texts; mostly Latin prayers and English hymns. It was probably compiled for (and by?) John Northewode, a monk of the Cistercian abbey of Bordesley, near Redditch in Worcestershire. 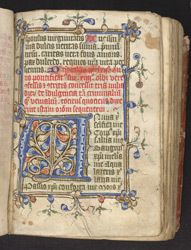 This illuminated initial introduces a prayer which (the rubric above tells us) carries an indulgence of 3,000 days, granted by Pope John XXII, in the 14th year of his papacy (c.1330). During the Reformation the words 'Pope John' were deliberately smudged, in accordance with King Henry VIII's order that the names of popes and of Thomas Becket should be obliterated.